A new light-activated therapy could make skin cancer treatment painless, inexpensive and portable. "It can be worn by the patient in a (Band-Aid), while the battery is carried like an iPod," said professor Ifor Samuel of the Organic Semiconductor Centre at Scotland's University of St. Andrews, who helped develop the technology, in a statement. Lumicure's treatment is a new twist on an existing treatment called photodynamic therapy. It starts with a cream containing aminolevulinic acid, which becomes photosensitive when it comes in contact with a cancer lesion. When exposed to light, the cream interacts with only the cancerous cells, making it a very selective skin treatment. 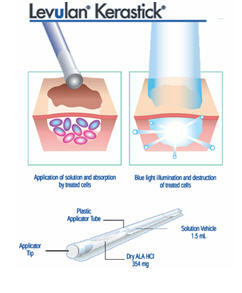 Lumicure's light source is a low-powered organic light-emitting diode embedded in a small adhesive device. Its battery module -- roughly the size of an MP3 player -- fits easily in a pocket. Photodynamic therapy available today requires treatment at a hospital using heavy equipment. It's also uncomfortable for patients because they must stay very still under extremely intense light; the treatment also can leave painful skin lesions. The new treatment takes longer than the standard therapy, but there's almost no discomfort and no scarring. "As traditional photodynamic therapy is delivered in a physician's office, this new technology, if proven effective in clinical trials, may offer the possibility of increased access and ease of use for many patients," said Dr. Isaac Neuhaus, assistant professor at University of California at San Francisco Dermatologic Surgery and Laser Center. Early human trial results are promising, and Lumicure hopes the light therapy will be available in about two years. Future iterations could target other skin problems including warts, acne and even wrinkles. Hmmm. This sounds promising. We do a fair number of photodynamic treatments and I've had a few myself to get rid of some ACs and Rosacea. I'd wear another iPod for a while.